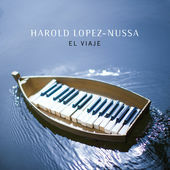 This new version of Harold López-Nussa's trio features a new bassist, Alune Wade, originally from Senegal, and makes full use of Mr. Wade on both bass and some atmospheric vocals. El Viaje is a rich blend of Cuban, African, Jazz and Funk elements, although at its core, it is a very serious Jazz album, and perhaps his most percussive to date. When I read the track list before listening, I was originally a little skeptical about the presence of Bacalao Con Pan, but it works far better than expected. (It should be noted that Harold also recorded La Yuka Funk a few years ago, and in some tracks, such as the closing Improv and D'Una Fabula, the Jazz/Funk elements come to the fore.) El Viaje (the title track) and Africa emphasize the African elements of the music. I suspect that we'll be hearing a lot more about this album in the coming months, and I would consider it a must-have.